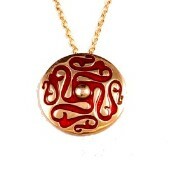 Highly polished, slightly convex bronze pendant with red cold enamelled design. 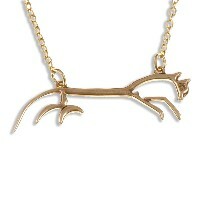 Gold-plated trace chain. Very early Celtic design originating from the Champagne region of France. Hand finished Pewter Celtic Triscele pendant with embossed design on surgical steel curb chain. The White Horse at Uffington is a highly stylised, prehistoric hill figure, 110m long, cut into the turf to reveal the under-lying white chalk. It is the oldest chal-cut hill figure in Britain, dating back over 3,000 years to the Bronze Age and is though to be of tribal significance. Hand finished Pewter openwork Bird Knot Celtic Necklace with large oval cabochon on surgical steel curb chain. Bronze openwork Celtic knot on gold-plated trace chain. 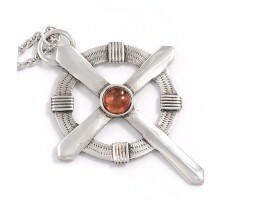 Hand finished Pewter Presele Blue Stone Celtic Pendant. 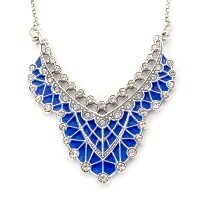 The Preseli Bluestone is often referred to as the Birthstone of Britain. It was used by the Druids to build the inner circle of the legendary monument of Stonehenge. Originating from the Preseli Hills in Pembrokeshire, West Wales, this stone is believed to possess great healing powers. 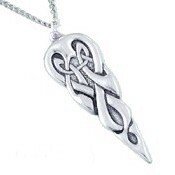 Hand finished Pewter Merlin's Spear knotwork Pendant on surgical steel chain. The earliest known references to King Arthur are associated with ancient Celtic mythology and so it is perhaps understandable that the name of Merlin was interwoven into Arthurian legend, and reflected the Celtic mystic beliefs. 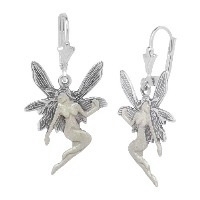 Merlin, also known as Myrddin and Merlinus, was often perceived as a wizard or magician. Amongst his powers he had the gift of clairvoyancy and foretold of King Arthurs rule over England. Hand finished Pewter openwork Celtic Bow Necklace with large oval cabochon on surgical steel curb chain. Hand finished Pewter openwork Celtic love knot pendants on surgical steel curb chain. Hand finished Pewter twisted Celtic Knot Necklace with large oval cabochon on surgical steel curb chain. 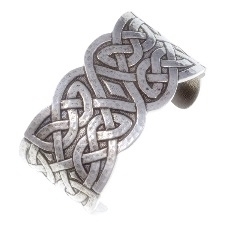 Hand finished Pewter Twisted Tin neck torc with pewter ends embossed with a Celtic knot. According to classical writers, the Celts wore torcs into battle. Both neck and arm torcs have been discovered in Britain and Europe and it is thought that they marked a person of high status, such as a warrior or chieftain. Hand finished Pewter Twisted Tin Neck torc with Pewter ends embossed with spirals which have a flat front and convex back. Hand finished Pewter Tara Serpent Necklace on surgical steel chain. In Celtic lore the serpent is the image of light, life and divine wisdom. Coming from deep within the earth, it was believed to hold secrets and be the guardian of hidden riches, metals, medical cures and esoteric knowledge. 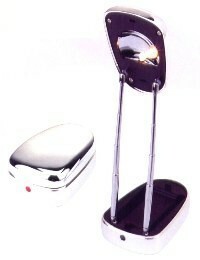 Suitable for use with loose weave fabrics only. Hand finished Pewter Double Knot Chokers / Necklace with Amethyst Stonese on surgical steel chain. 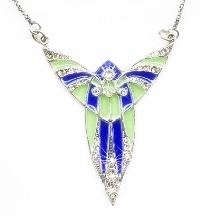 Hand finished Pewter Batwing Knot Necklace with Turquoise Stoneset on surgical steel chain. 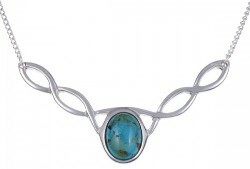 Hand finished Pewter Double Spiral Necklace with choice of Amber or Turquoise Gemstone. 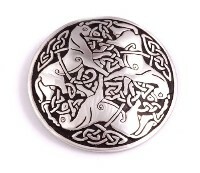 Hand finished Sterling Silver Lugh's Knot Celtic Necklaces / Pendants. Hand finished Sterling Silver 3 Loop Celtic Love Knot Neclklaces / Pendants. Hand finished Sterling Silver Celtic Love Knot Pendants / Necklaces. 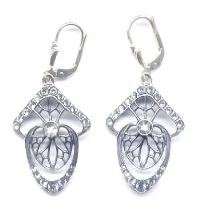 Hand finished Sterling Silver Celtic Love Knot Heart Neclklaces / Pendants. 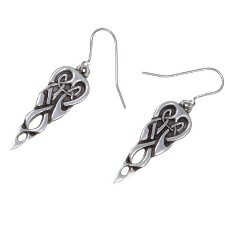 Hand finished Sterling Silver Figure 8 Celtic Knot Necklaces / Pendants. Hand finished Sterling Silver Celtic Multi Knot Pendants / Necklaces. 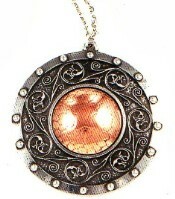 Hand finished Pewter Rosemarkie Pendant on surgical steel chain. 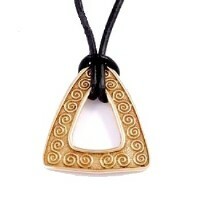 Hand finished Bronze pendant with embossed spiral design on black leather thong. 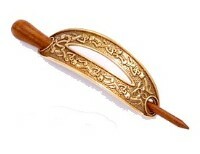 Design inspired by a gold sword fitting found amongst the Staffordshire Hoard. 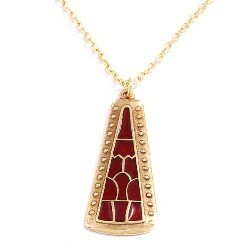 Hand finished Saxon Bronze Pyramid pendant with cold enamel on gold-plated chain. 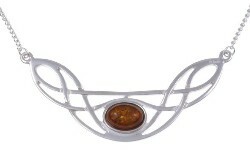 Design inspired by a gold sword fitting inlaid with garnet found amongst the Staffordshire Hoard.